THE Third Ambassadors’/Consuls’ General Tour of the Philippines brought in not just eager Filipino-American tourists but also foreign businessmen looking at possible areas of investment in the country. About 650 Fil-Ams, including a significant number of Caucasian– Americans and Canadians, were in the country from July 14 to 20, attending business and investment briefings, treated to sumptuous dinners and lunches of Philippine dishes, brought to several shopping trips, as well as entertained in various resorts and tourist destinations outside of Metro Manila. In an interview with the BusinessMirror, Philippine Ambassador to Washington, D.C. Willy Gaa said the demand for slots in this year’s tour was overwhelming. “So far [the tour group] has really been increasing in numbers since its start three years ago. And this year we even had to put a cap on the number of applicants for the tour. [The biggest increase came from] California, specifically, Los Angeles.... We, in fact, had more on the waiting list. We had problems with the accommodations already,” Gaa said. In previous tours, only the Makati Shangri-La Hotel was booked for the participants, but this year, even the Peninsula Manila hosted a number of the delegations. A number of the participants were first-time balikbayans, according to Gaa, with their Americanized children in tow, while there were some who had joined a previous tour. Philippine Ambassador to Canada Jose Brillantes noted the growing number of American/Canadian tourists who have joined this year’s tour but also have business interests in mind. Canada, where about 400,000 Filipinos live and work, is a major investor in mining around the world. Brillantes declined to name the investors pending closure of their deals with local businessmen. Megaworld Corp., a property development company owned by Andrew Tan, apparently reaped the most benefit from the tour this year with the balikbayans sinking in their hard-earned dollars into several condominium units. Angela Cortes, senior sales director of Megaworld, disclosed that the company received many inquiries into its township development called McKinley Hill, a 50-hectare property in Fort Bonifacio, Taguig. The Philippine Ambassadors’/Consuls’ General Tour is a brainchild of Albert del Rosario, conceived during his stint as ambassador to Washington, D.C. It was designed to encourage more Fil-Ams to visit their home country and spread the word on its business and travel opportunities. The annual tour, begun in 2005, is a joint effort by the Departments of Foreign Affairs (DFA), Tourism, and Trade and Industry (DTI). Participants from the US mainland paid at least $1,949 for a basic tour package from July 12 to 17, which included roundtrip airfare, four-night hotel stay (twin-share), three meals a day, including a special lunch and visit to Malacañan Palace, as well as city and day tours. From July 17 to 20, optional tours to major provincial destinations were made available to the participants at an additional cost, ranging from $349 per person, twin sharing, to $764 per person. 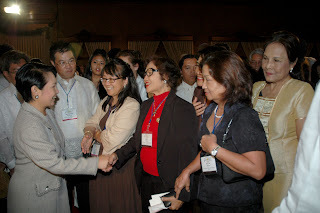 The visit to Malacañang on July 16, and the photo opportunity with President Arroyo, proved to be the tour’s highlight. “I’ve visited the Philippines a number of times,” said one long-time Fil-Am resident of New Jersey, who requested anonymity, “but this is the first time I’ve ever been to Malacañang!” She said she hoped to have her eldest daughter enroll in a local private university by next year. Even Dr. James Stadler, medical director of the Guam Memorial Hospital, who joined the tour with his Fil-Am wife, Virginia—a nurse and member of the Guam Symphony—described the visit as a “once–in–a–lifetime experience” to meet President Arroyo. However, there were a few who had joined the previous tours, like Eloise Baza, president of the Guam Chamber of Commerce, who were disappointed and wondered “why the President did not give any speech.” No official explanation was given for this, but a DFA source told BusinessMirror that “it is now the President’s official policy to give only one speech a day.” At noon that day, the President had already spoken before participants of the 2007 Corporate Social Responsibility Expo at the Sofitel Philippine Plaza. In the previous tours, President Arroyo had managed to whip the tour participants into frenzied clapping as she outlined the accomplishments of her administration and encouraged them to invest in the country. Last year, she even pushed the Fil-Ams to support her campaign for Charter change. This time, the President merely exchanged a few pleasantries with some members of each tour delegation as she sat throughout the souvenir photo-taking with Executive Secreatry Eduardo Ermita, Foreign Affairs Secretary Alberto Romulo, and Trade and Industry Secretary Peter Favila. Before the photo opportunity with the President at the Rizal Hall, the tour participants viewed the various historical items on display at the Palace museum and then had a lunch of native Filipino dishes catered by Via Mare at the Heroes’ Hall. On July 14, the DTI urged the tour participants to invest in the Philippine countryside during a business briefing at the Forbes Town Center, a major business/residential development of Megaworld and the Bonifacio West Development Corp. at The Fort in Taguig. During the same briefing, Bing Limjoco, president of the Philippine Franchise Association, spoke of the opportunities in investing in local franchises. She also noted the success and continuing expansion of Jollibee Foods Corp. because of franchising, edging out the US-based McDonald’s Corp. in the local fast-food business. The tour group was also treated to a discussion of the local jewelry industry by Cecilia Ramos, owner of Ricel’s Jewelry and chairwoman of the Meycauayan Jewelry Industry Association Inc. Meycauayan, Bulacan, is envisioned to become the center of world-class fine jewelry in the Philippines, she said. Bulacan has long been known as the site of the country’s best manufacturers of gold jewelry, exporting millions of dollars worth of products to the world market. Even before Ramos’s speech, however, many tour participants were observed checking out the gold and silver jewelry for sale at the ground floor of the Forbes Town Center. Nancy, a Honolulu-based Fil-Am, expressed particular interest in buying some pieces on exhibit. According to Ramos, the price of Philippine gold jewelry is 30- percent to 60-percent lower than those made in other countries like the US, Italy and Saudi Arabia. In the evening of the same day, the tour group feasted on dishes from the Mindanao region during a welcome dinner hosted by the Department of Tourism at the Sofitel Philippine Plaza. A fashion show was also held featuring the Muslim-inspired creations of veteran Filipino designer Toni Galang, whose clientele include Fil-Ams on Guam and the mainland US. He is well-known for his intricately designed wedding gowns. The tour participants also lapped up Muslim accessories on display at the hotel. On July 15, the different delegations separated for day tours to Corregidor, an island off Manila Bay, which became the headquarters of the Allied forces in the Pacific and the temporary seat of the Philippine Commonwealth during World War II; Villa Escudero, a resort featuring man-made waterfalls amid a vast coconut plantation; and Tagaytay to get a glimpse of the world-famous Taal Volcano. Businessman Frank Shimizu, president of Ambros Inc., the wholesale distributor of Budweiser, as well as Bristol Myers, Kimberly Clark and Mead Johnson products in Guam and the Northern Marianas, said, “It’s my first time [to join the tour] and it won’t be my last. . . . We went to Corregidor and it was an eye-opener. Anybody who wants to learn about World War II, I recommend that they go see Corregidor.” Shimizu was in town with his wife Fermina, the aunt of Guam’s First Lady Joann Camacho. Aside from the visit to the Palace museum, the participants also toured the National Museum for Philippine artwork, the Bangko Sentral ng Pilipinas Money Museum for its coin collection, and the Metropolitan Museum for its precolonial gold exhibit. The tour group was also brought to major shopping destinations in the metropolis, such as the Mall of Asia of the SM Group along Roxas Blvd., and Tiendesitas, a bazaar in Pasig City.